ST. GEORGE — Authorities are offering a reward for information about the individuals responsible for vandalizing a public restroom at the Water Canyon Trailhead north of Hildale. The damage was discovered Nov. 4 and includes a dismantled fence, broken restroom door and burned toilet facility. 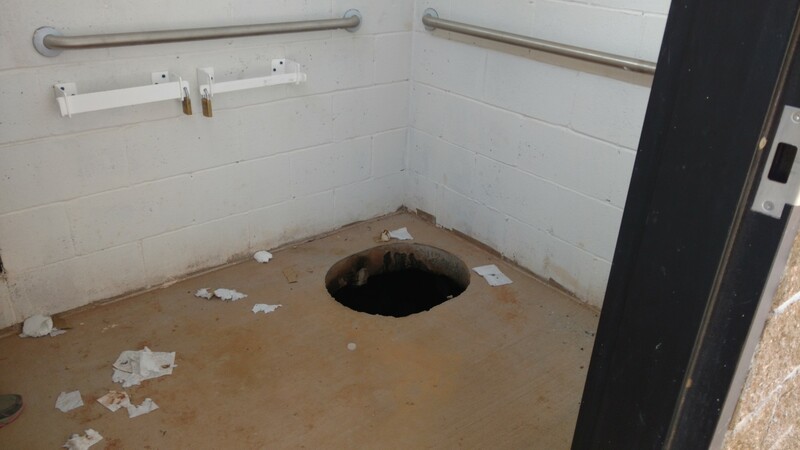 “Inside the restroom facility – that was set on fire – the latrine was burned,” Bureau of Land Management Fire Mitigation and Education Specialist Nick Howell said of the vandalism. The BLM is offering a $1,000 reward for information leading to the conviction of those responsible. “Right now, there aren’t any suspects, and we don’t have any new leads on the case,” Howell told St. George News Monday. The restroom is closed while the facility undergoes repairs. “This newly constructed restroom facility and trailhead were installed to accommodate the increasing recreational use in the area,” BLM St. George Field Office Manager Keith Rigtrup said. Anyone with information is asked to call BLM Law Enforcement at 800-227-7286. Callers may remain anonymous. Wow! It must be a really slow news day. look like the latrine burned so red hot it melted a big hole into the ground. hot as lava.